With a strong connection to the Royal Navy spanning literally centuries, the city of Portsmouth was once an integral part of the world's shipbuilding industry, building the first ever dry dock in the late 15th century, which is still used today. 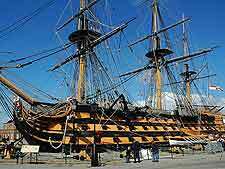 Portsmouth remains a significant base for the Royal Navy and is called home by many extremely distinguished ships, with its crowning glory being the flagship of Lord Nelson, the HMS Victory. Due to its strategic prominence, Portsmouth was bombed quite extensively during WWII and so is now very much a mixture of new and old, with some the most historic areas including the Hard and the Point. The suburb of Southsea is a firm favourite of families holidaying in Portsmouth and features a lengthy stretch of beach, two piers and a good tourist information centre. Southsea is a particularly lively part of Portsmouth, being filled with bars, cafes, endless entertainment and a fun theme park at the Clarence Pier. When it comes to accommodation in Portsmouth, there is certainly much to choose from, with lodging often being conveniently close to the seafront. The majority of the most popular B&Bs tend to be centred around the Southsea promenade and soon fill up in the summer. Offering views of the South Parade Pier and just across from the beach, Best Western's ever popular Royal Beach Hotel is a good choice for families looking to be central to the action. Cheap hotels are always in demand, although those based around the trendy Gunwharf Quays tend to be on the pricey side, due to their close proximity to seemingly endless shopping, entertainment and nightlife options. 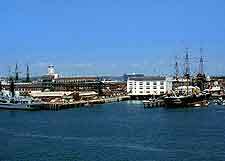 It is the Historic Dockyard that draws the most visitors and you may also hear this tourist attraction referred to as the Flagship Portsmouth. The area is where the HMS Victory is to be found, and guided tours around this magnificent vessel are not to be missed. Virtually next door is the historical ship the Mary Rose, which was famously raised from the sea in 1982, after spending almost 450 years at the bottom of the sea, just off the Portsmouth coastline, between Southsea and the Isle of Wight. Do consider taking a cruise around the harbour, which offers a different view of the city's renowned naval vessels. More information about Portsmouth Tourist Attractions. Standing on the coastline of the city are some surprising medieval fortifications, such as the remarkably well-preserved Round Tower and Square Tower, both of which date from the 15th century. 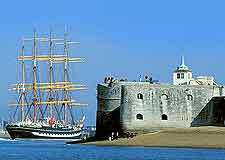 Also of historical significance in Portsmouth is the Cathedral of St. Thomas of Canterbury, the Spitbank Fort and the Southsea Castle, where it is documented that King Henry VIII once stood, watching the Mary Rose battle with the French, before sinking before his very eyes. Portsmouth continues to reinvent itself and one of its most striking modern landmarks is the gleaming white Spinnaker Tower, which was erected as recently as the new millennium and is visible for quite literally miles, resembling a ship's sail blowing in the wind. More information about Portsmouth Landmarks and Monuments. The Historic Dockyard museums are packed with information about Portsmouth's shipbuilding past, with the National Museum of the Royal Navy being a good place to come and learn more about the history of the HMS Victory and Nelson himself. Also located here is the Mary Rose Museum, which contains a huge amount of artefacts salvaged from the ship itself. The City Museum and Records Office contains much Sherlock Holmes memorabilia, since its creator Sir Arthur Conan Doyle, once lived in Southsea. There is also a large collection of art here, while other museums in the Portsmouth area concentrate on subject matters such as submarines, naval firepower, the Royal Marines, natural history and the D-Day events. 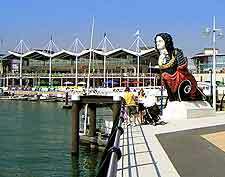 More information about Portsmouth Museums and Portsmouth Art Galleries. Although tourists can easily spend a week in Portsmouth visiting the city's naval attractions and spectacular shopping malls, there are many further sights to see close by. 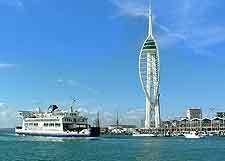 Popular day trips from Portsmouth include city of Chichester, the towns of Fareham and Gosport, and the seaside resort of Bognor Regis. 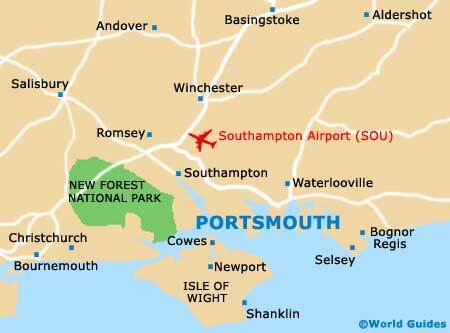 Southampton and Winchester are also within easy reach, while others prefer to take a quick hovercraft to the Isle of Wight and spend a day sunbathing on its glorious beaches. More information about Portsmouth Attractions Nearby.